St. Pierre and Miquelon are two small groups of islands off the southern coast of Newfoundland. They were formerly a French colony, and became a Department of France in 1976. In 1931 the French government brought together people from its 47 colonies in order to educate the French nation to the importance of their colonies. The stamp was issued in a set in recognition of the Exposition Coloniale et Internationale. The Mi'kmaq called themselves L'nu'k, "the people." Mi'kmaq means "my friend." They lived on the north Atlantic seaboard, Nova Scotia, Newfoundland, and Arcadia. Micmaq tradition claims that a white man, possibly the Norwegian, Henry Sinclair, landed on Nova Scotia near the end of the 14th century. 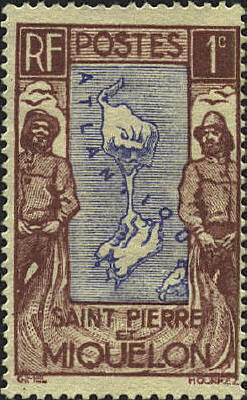 The body of land at the top and right of the stamp is Newfoundland. The dumb-bell shaped island is Miquelon, and the small island south-east of Miquelon is St. Pierre. The Conne River is a Mi'kmaq reserve on Newfoundland. The red canoe and the red dotted line between Miquelon and Newfoundland may indicate the route the Mi'kmaq took to Newfoundland for summer hunting. The catalog identifies the stamp as, "Micmac Indians of Miquelon." The connection with 1504-2004 is not made clear.